We are not islands. We do not live in bubbles. Okay. Enough with the metaphors. Sometimes whether we like it or not, we exist in a world with other people, and those people can have fundamental impacts on our lives and careers. I can say that my family has been largely responsible for me being who I am. Growing up, my parents not only exposed my sister and I to art forms like musical theatre but they encouraged my creativity, tolerating my banging on the piano when I made a mistake, cheering me on when I performed, and paying for lessons and whatever else was required. Before my father passed, he made sure to tell me that if I wanted to be a songwriter, I should go and be a songwriter. And when I have thought about giving up, when I have contemplated getting a regular job and leaving music behind, my mother and sister remind me that this is what I’m here to do and they’ve got my emotional, spiritual, and financial back. Or is it backs? Anyway, I guess my point is that we don’t do this alone. Yes, we work really hard to hone our craft, pitch ideas, promote the heck out of our latest project on social media, and we’ve gotta give ourselves props for our efforts. But while we’re reaching for the stars and getting our diva on, acting like it’s all about us (not that I’ve ever been that way 😉 ) it can be all too easy to expect the support to just be there or forget all the investment that others have made in us from potentially a very early age. It behooves us to remember those who are helping us on our path. And I don’t mean in an “all the little people who helped me get here” award speech kind of way. Family, teachers, mentors, the keyboard guru at the music store, the super helpful tech support guy – we likely wouldn’t be doing what we’re doing without them. Seriously, I am a very tech-savvy individual but if I didn’t have someone to call when things went really wrong I wouldn’t be able to function at all because my tech is how I do what I do and I’m not sure I’d want to go back to the days of wax cylinders. At any rate, we need to show our appreciation for the contribution of others to our work and our lives. This gratitude can be expressed in different ways depending upon the relationship – I keep telling my mom that she’s getting the west wing of my mansion. Sometimes an honest, heartfelt thanks is all that is required. Sometimes a small gift is more appropriate. Just make sure you don’t let things go unsaid or treat these people like they are at your beck and call because, believe me, they have other things they can be doing with their time, money, and energy. 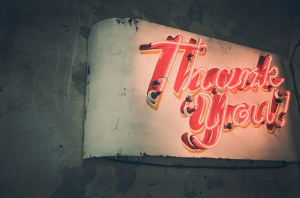 Now, the appreciation is its own reward – it just feels good to tell people you’re grateful – but it also allows the recipient to become even more invested in you and more willing to step up and go the extra mild in the future. Like I said, you should do it just to do it without any expectations but it could be a nice bonus. Just saying. Tell those who have come out to your show that it was great to see them and you hoped they enjoyed it. Thank those who have agreed to proofread your writing by taking them out to lunch if you can’t out and out pay them. If you want to give the Geek Squad guy or girl a hug for replacing your hard drive without losing any data, tell them so, even if they don’t want you to actually do it. So, that’s my message for today. Realize that you are not alone in this – even if you’re writing all your songs, performing all the instruments, and producing the tracks – and express gratitude for those who are have come along for the ride. On that note, I feel compelled to share the song Thanks from Ladybug Crossings. You know, ‘cuz it’s about gratitude. Have a great day and keep on creating!